The Great Water (Golemata Voda) is a 2004 Macedonian film directed by Ivo Trajkov. A Macedonian politician having a heart attack experiences flashbacks to his childhood in 1945. There, he finds himself in an orphanage, the main purpose of which is to “brainwash” the children in Communism, turning them into “Patriots” against fascism. But the appearance of the mysterious boy Isak is a catalyst for a series of events that will have serious consequences for all. A powerful film, The Great Water focuses on showing how the orphaned children suffer at the hands of those who run the orphanage. The film has a hint of the supernatural about it that revolves around Isak: he has a mysterious influence both on the children and the adults (that is not really explained). The reliance on moody camerawork and meaningful glances rather than large amounts of dialogue places a large onus on the composer to provide support for what is happening on-screen. Composed by native Macedonian Kiril Dzajkovski, the music ably delivers. A prolific musician associated with the fusion of traditional Macedonian music with electronica, Dzajkovski has also written a significant amount of music for theatre, film and television. Using the London Telefilmonic Orchestra (a group of musicians drawn from major London orchestras), as well as ethnic Macedonian instruments, Dzajkovski gives The Great Water a dark, oppressive feel that is punctuated by the required supernatural overtones, emotional highlights and tragedy. The album has numerous highlights. The music features three or four lovely themes, some dramatic percussion and interesting atmospheric interludes (all featuring subtle ethnic influences). The first few tracks on the album are an excellent summary of the score as a whole. “Chasing Lem” and “Blood Brothers” (and also heard later to wonderful effect in one of the score’s highlights, “Drought Break”) are exciting tracks where ethnic percussion establishes exotic, driving rhythms that are embellished by additional ethnic instruments such as kanun (a type of zither), kaval (rim-blown flute) and screaming zurla (double-reed horns). The second track “The Great Water”, which plays during the title credits, features the beautiful solo voice of Milena Arsovska whose wordless vocalisations arise several times throughout the film It is this theme that helps to give a supernatural feel. A lovely (though melancholic) second theme appears several times in the score, and each time the composer uses different orchestrations to subtly alter the theme’s tone: ethnic fiddle, piano and solo male voice in “Icon of Love” gives the theme a very personal feel (as does the track’s use in the film that suggests it is a piece of source music), solo clarinet and accompanying accordion impart a melancholic tone (“Snow Kiss”) and when the theme is played as if from a musical box, the theme takes on a delicate, fairy-like quality (“Secret Place”). “Forgiveness” is a highlight both on the album and in the film. This track features a third theme that supports one of the most effective scenes in the film – an effectiveness that is very much down to the power of Dzajkovski’s music. A mournful theme played on solo ethnic violin, it has such a powerful effect in the film as to make the audience feel sorry for the headmaster of the orphanage: a man who has been responsible in no small part to the children’s daily suffering but who also has a secret. The power of the composer’s music is such that it’s as if, like the children, we are being brainwashed into feeling pity for the man. Finally, one track (“Dream Box”) – which features another memorable theme – sounds a bit out of place in the score. More up tempo than most of the rest of the score, it feels more like a track one would hear as source music in a café or dance hall. It is, in fact, the track that underscores the end credits and its placement in the middle of the album is a bit puzzling (the tracks are not in film order but are probably arranged for the best listening experience). 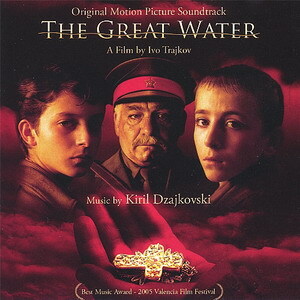 Dzajkovski’s score for The Great Water won Best Soundtrack category at the 2005 Valencia Festival of Cinema. And I can see why. It’s a score that is full of memorable themes, mesmerising vocals and makes good use of ethnic instruments. This is the first film score I have heard from Dzajkovski and on the evidence heard here I want to hear more of his work. This is a very impressive album and I recommend it to everyone who loves thematic film music. The album is available as a digital download at the usual outlets.